Central Diamond Center has become a place where I have been frequenting lately for my jewelry needs. After receiving a gorgeous ring that includes the birthstones of all my children, I have not been disappointed with the quality of their work. Just recently, I needed a new ring. Yes, I said needed. I hate to admit it but since I said the words, "I do" I have gained not only five children, but, fifty pounds as well. Which is fine, I was skinny as a rail when I got married but still, nobody likes to admit weight gain. They don't like to talk about the complications that go with it either. Such as rings not fitting quite like they used to. Sure, I have still been wearing the ring he placed on my finger so many years ago but I have been fearing I would never get it off. Therefore, I decided to go ahead and get a temporary ring in the meantime. Maybe looking at this ring will motivate me to use those pilates videos I have sitting three feet away from me right now. I love, love, love the ring I received from Central Diamond Center. It is gorgeous, just the right size so that it won't cut off blood circulation and fun to wear. For only $1 each, I ordered some boxes to put my "real" engagement ring in as well as other rings that I have. Come to find out, you can fit two rings per box, love it. Special Offer - Save 10% Off already low prices. 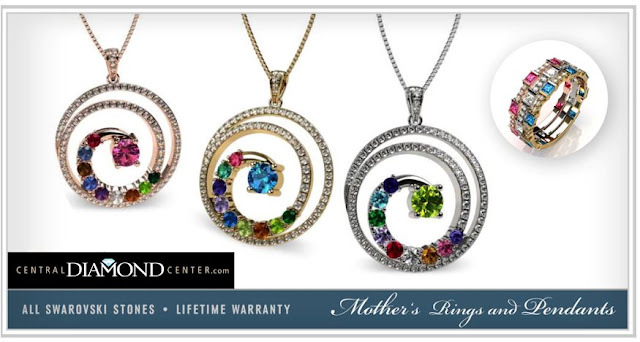 CentralDiamondCenter has been designing rings for moms for 30 years committed to creating exceptional mothers pendants, rings and earrings at affordable prices. Central Diamond Center has been designing rings for moms for 30 years, and we have no intention of slowing down! Our company is committed to creating exceptional mothers pendants, rings and earrings at affordable prices. I also ordered the necklace pictured below which was on sale for a great deal! I love browsing their site and seeing what they have to offer! Disclaimer: I received free products from the Central Diamond Center for the purpose of this post. All thoughts and opinions are my own. Thanks to US Family Guide for this partnership.